I have read and annotated my books for a long time, but I have always subconsciously been unhappy with the system I developed. So I’ve done some research, and come up with the following system. Feel free to comment on your own system. One of the things I love about the Table of Contents of some old books is that they include detailed descriptive section headers, and those section headers often adorn the top of the pages. Some bibles use this same method to help you scan pages for specific content (Figure 1 below). This same method can help you return to a book you notated months or years ago and find the content you are looking for. There are still some times when you want to highlight individual sentences or words, even if you are using vertical lines on the side. For example, whenever I find a word I need to look up, I underline it. There is no need for color unless you have some color code in mind, but I find margin codes much more useful than a color code, you are not limited to your color pallete, which will max out based on how many colored pens you have at your immediate disposal. Margin codes are one of your most powerful annotation tools. You can make an endless list of attributes, they are somewhat self explanatory (unlike a color coded highlight system that forces you to have a color legend), and they have a small footprint. 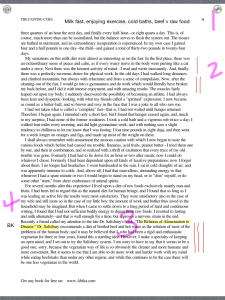 Also, such text-based indicators are searchable in some PDF annotation programs if you are reading a soft copy. Separate Notebooks: This gives you unending space, but good luck keeping the notebooks organized and near your book. 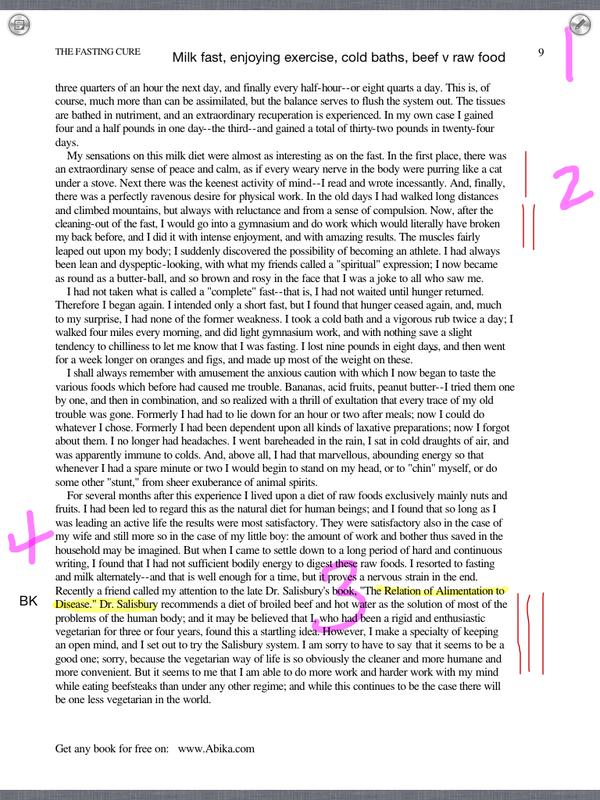 Electronic Notes: If you are annotating on a Kindle or PDF annotator, you can keep extended notes in the book. This, of course, won’t work for paper books. Endpage Notes: If you don’t intend on writing a book of your own, you can make some extended notes on the inside of the front and back covers. Just be sure to include page numbers. That’s my method. I am currently looking into annotation programs for the iPad, I have to say, the Kindle app is not very good at annotation, but there are some PDF annotation apps that look promising, though each seems to lack at least one key feature. I’ll let you know what I find out.